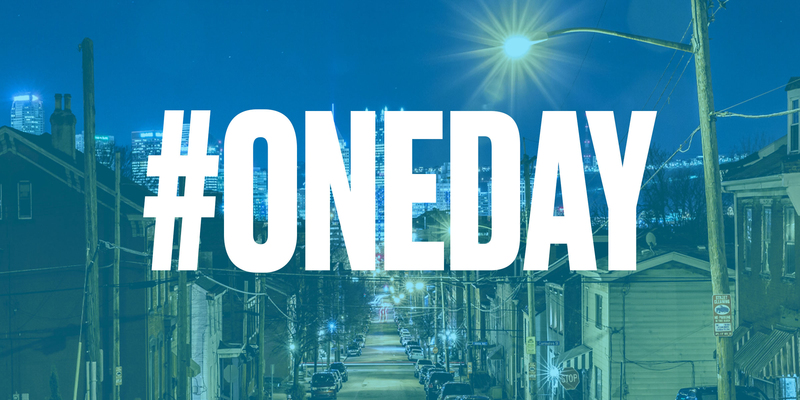 Give generously on May 7 to the #ONEDAY Critical Needs Alert serving more than 190 organizations that support basic needs in Allegheny and Westmoreland Counties. Established in 1945, The Pittsburgh Foundation is one of the nation’s oldest community foundations and is the 14th largest of more than 750 community foundations across the United States. From the shores of the South Side, the image is of the Fort Pitt Bridge connecting to downtown Pittsburgh. The Center for Philanthropy is a unique resource that provides donors with opportunities to make a bigger impact with their charitable giving. 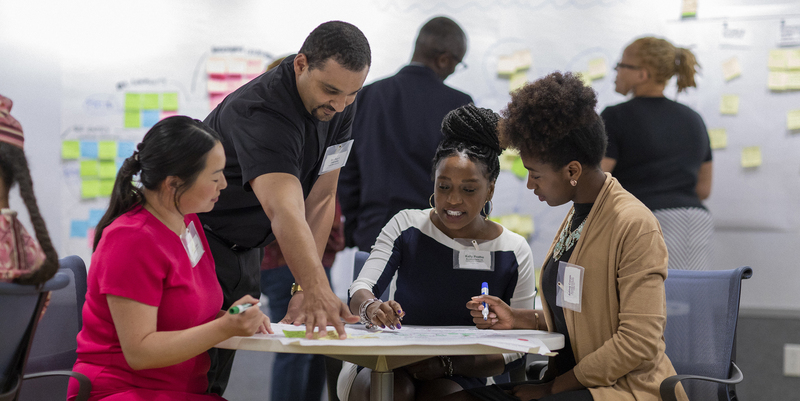 Members of The Buncher Change Agents convening at The Pittsburgh Foundation focused on human-centered design and aims to develop solutions to issues, such as harrassment, by involving people in every step of development. 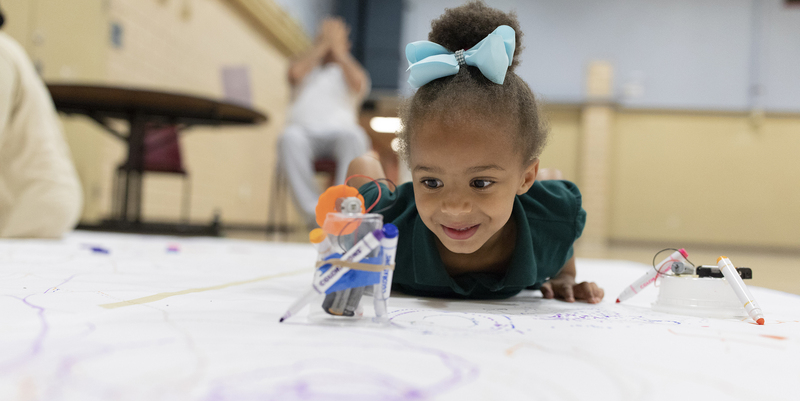 Kai Lewis, 6, watches a painting robot while attending "mix-up" night at Providence Connections where families dined and then played with art-making robots and stop-action animation, among other activities. Providence Connections supports 400 children and their families by providing childcare and family support services, including many single women raising a child — a focus of our organizing principle, 100 Percent Pittsburgh. Each summer, the Westmoreland Symphony Orchestra (WSO) draws large crowds to their concert in St. Clair Park in Greensburg. The Community Foundation of Westmoreland County, also based in Greensburg, has provided funding to the WSO. The Pittsburgh Foundation works to improve the quality of life in the Pittsburgh region by evaluating and addressing community issues, promoting responsible philanthropy and connecting donors to the critical needs of the community. PITTSBURGH, April 15, 2019 – The Program & Policy Committee of The Pittsburgh Foundation Board of Directors approved $2.9 million for 51 grants in the first-quarter grant-making cycle. THE SENSE OF SHOCK AND OUTRAGE at the acquittal of former police officer, Michael Rosfeld, for the criminal homicide of 17-year-old Antwon Rose is understandable, and we share it. All of us need to pay close attention. PITTSBURGH, March 27, 2019 – With at least one-third of the regional population living at or on the verge of poverty and struggling to meet basic needs, The Pittsburgh Foundation is organizing a Critical Needs Alert online fundraising event this year with its largest-ever incentive pool of $788,000 to help bolster giving from the public. The Johnson Institute for Responsible Leadership, honored philanthropic leaders Maxwell King, president and CEO of the Pittsburgh Foundation, and Grant Oliphant, president of The Heinz Endowments, for their strategic, innovative and transformational leadership as recipients of its Exemplary Leadership Award. The Foundation leads a regional initiative to reduce the numbers of people forced from their homes.